Mr. Apolonio "Nono" Flores passed away on January 26, 2019 in San Antonio, Texas. Born in Laredo, Texas, Nono was a long-time resident of San Antonio. He is survived by his wife, Mary Helen Henry Flores, sons Michael H. Flores, and Thomas J. Flores, brothers Antonio Flores (Elizabeth), Leo Flores (Patsy), Fernando Flores, and sister-in-law Linda (Daniel Flores, Jr.). Brothers-in-law James Henry (Nora) and Robert Henry (Leticia), plus many nieces and nephews. He was preceded in death by parents Daniel and Alicia, sisters Margarita Nutt, Diamantina Peña, Delia Pennock and brother Daniel Flores, Jr.
After graduating from Texas A&M University, Nono served as auditor with the Office of Inspector General (U.S. Department of Agriculture), Supervisory Auditor with the Office of Inspector General (U.S. Department of Housing and Urban Development), and a year as Special Assistant to the Inspector General as a participant of HUD's Executive Identification and Development Program. As a Certified Public Accountant, Apolonio was a member of the American Institute of CPAs, Texas Society of CPAs, the San Antonio chapter of CPAs, and the American Association of Spanish Speaking CPAs. Nono is known for his stewardship of the Housing Authority of the City of San Antonio, serving as its President and CEO from 1979 to 1997. 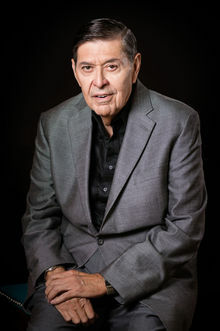 During his tenure at the Housing Authority, Mr. Flores secured millions in federal grant money to preserve and increase affordable housing units for the residents of San Antonio, expanding the Housing Authority's inventory of affordable housing by more than 3,500 units through his pioneering use of non-profit corporations and innovative financing, transforming the authority into a model for housing authorities nationwide. He was a forward-thinking leader. For instance, Flores formed a company for San Antonio public housing residents to manufacture cabinets, window screens, and steel doors. He also helped create resident-owned businesses that led to higher tenant incomes. He created a robust Family Self-Sufficiency program by requiring all entry-level positions be filled by public housing residents, as well as a Home-Ownership program. He strongly believed that providing safe, affordable housing to economically disadvantaged people was just part of the Housing Authority's mission. He was committed to giving the housing authority residents a path to economic stability and homeownership and he did this by championing strong community partnerships and resident involvement. His expertise and passion for ensuring affordable housing was recognized both locally and nationally. His professional affiliations included the National Association of Housing and Redevelopment Officials (NAHRO), serving as President; the Housing and Development Law Institute; the Housing Research Foundation; the Texas Housing Finance Corporation; and the Housing Authority Television Network. Apolonio also received the highest award from both the Southwest Regional Council of NAHRO and Texas NAHRO and was the first member inducted into the Texas NAHRO Hall of Fame. In 1988, President Ronald Reagan appointed Mr. Flores to serve as a Member of the White House Conference for a Drug-Free America. In 2008, Mr. Flores was selected as NAHRO's recipient of the M. Justin Herman Memorial Award in recognition of his outstanding achievements and innovation in the housing and community field. He was often invited to speak at national and international conferences because of his expertise in public housing. Apolonio Flores' commitment to public service was always evident. He served in various board positions, including chairman, for the Bexar County Mental Health and Mental Retardation Center. He served on the PTA's of both his sons' schools, on the Public Administration Advisory Council at Our Lady of the Lake University, the Regional Human Resources Advisory Committee of the Alamo Area Council of Governments, the Greater San Antonio Chamber of Commerce Urban Affairs Committee, and Advisor to the San Antonio City Council Housing Task Force (to name a few). After leaving the Housing Authority, Mr. Flores continued to work in the affordable housing sector, forming Flores Residential, LC, which provided consulting services to housing authorities, non-profit organizations, developers and others. Nono was one of the country's leading experts in Tax Credits for affordable housing. Upon learning of Flores' passing, one housing official commented that, "the housing industry has lost a giant and a true friend." His passion for providing affordable housing was eclipsed only by his passion for his alma mater Texas A&M University. An avid Aggie football fan, he took his youngest son, Tommy, to all of the home games. Nono enjoyed spending time with his family, often having them join him on his business trips around the nation and world. A near constant in his life was dinner with his family and friends after Saturday mass. He will be missed by his family, as well as by a host of former colleagues, employees, and friends. Godspeed, Nono. The family will receive guests on Sunday, February 3, 2019 from 4:00 p.m. to 6:00 p.m. at St. Anthony De Padua Catholic Church, 102 Lorenz, San Antonio, Texas 78209. We have lost a very special person. Nono and I have worked together on various CPA projects for more than 40 years ... primarily with the Texas Society of CPAs and San Antonio Chapter PAC and Governmental Affairs Committees. He was always ready to share his knowledge and expertise and was always a fine gentleman. Recently Nono was kind enough to write a letter of reccomendation for my grandson (George Eifler) to submit with his application to attend A & M. May the Lord be with Nono and the family. Thoughts and prayers are with you and your family during this difficult time. Mary Helen Henry Flores, Michael and Tommy please accept our deepest condolences. My heart just broke when I got the news about your husband/father today. A few days ago I was thinking about you Mary Helen and was wondering how you were doing. My prayers are with you during this difficult time. Sending love and prayers to your entire family. Nono will be greatly missed by all who had the pleasure of knowing him. May God bless and comfort your family. Nono was a great guy with a big heart who did God's work here on earth. Nono will be missed here on earth but he is in heaven with God now. Nono was an Aggie buddy and a friend from his work at the Housing Authority and my work at the City of SA. We were also together in a variety of aggie groups like the SA Aggie club and SA Class of '62 group. He loved TAMU and was a great supporter of its programs and ideals, namely RELLIS. And he was an outstanding leader at the housing authority and in many other professional groups. He will be greatly missed by me and his many Aggie buddies!! Godspeed and best wishes to his family at this time of their loss. My deepest condolences to the Flores family. You are all in my prayers. Our sincerest heartfelt condolences. Nono was a true pioneer and genius that will be greatly missed. ( My plan was to be but my mother just got hospitalized. ) donation to Arc. Nono will be missed, especially during his visits down the hall at TAMU football games, pls tell Tommy to wear his fathers Aggie ring with pride, continued prayers and peace for the entire Flores clan. Please accept my sincere condolences. We are deeply saddened by the news of Nono's passing. Among the NAHRO family, it is well said that we have lost a Giant in the Housing industry and a friend. I have fond memories of Nono. He was the most innovative leader in the housing industry and I consider it a privilege to have known him. The NAHRO family and I will forever hold him in the highest regard. I pray that the Lord, the Mighty God, will comfort you and your family and grant you peace, His peace that surpasses our understanding. Dear Nono, a note of deep gratitude for your proactive accomplishments in providing fair and decent housing for many socially and economically disadvantaged families in San Antonio and South Texas. You will be missed! Our prayers are with you and your dear family. Be at Peace Nono with GOD Almighty in Heaven. He will be missed and never forgotten. Nono was a pioneer in the housing field and a true and loyal friend. Mary, Michael and Tommy I pray for God's angels to encamp around you during this difficult time. Rest in Peace, Apolonio Flores. God's blessings to the Flores family and friends. Dear Mary Helen, Michael and Tommy, we are sorry to hear of Apolonio's death and pray for your consolation. He was a very nice man, in addition to all of his public service accomplishments. It was a pleasure and an honor to have known him. Nono: rest in the peace and love of God! It was an honor and pleasure to have known you and worked with you here in SA with a fellow Laredoan. My sincerest condolences to the Flores family. My most sincere condolences to the family and friends. May the words of our Heavenly Father at 2 Cor 1:3 reassure you that He can give you the power to endure this grief and will sustain you. Diana and I offer our deepest condolences. I am tremendously bereaved upon the loss of my best buddy. Nono positively influenced my life. I'll cherish his advice humor and friendship. I shall miss him but God has a special place for him. Regrettably we have previously scheduled medical procedures and are not able to attend services. Our prayers are with your family. Mary, Michael, Tommy and family, John and I are thinking of you with prayers and deep and sincere sympathy. Nono, a loyal and good friend for decades, will be missed by his Aggie family and all his friends. The memories will always bring smiles to our hearts and minds. Our most sincere condolences on Nono's passing to a much better place. His good deeds precede him as the Lord shows him the way to his heavenly abode. We will join you at the visitation. Thank you, Nono, for all the memories. You were fearless. Those of us fortunate enough to have worked beside you were never bored! You made us laugh, cry, pull our hair out, but most of all, you made us better. Our sincere sympathy to Mary, Michael and Tommy. My sincere condolences to the Flores Family. Nono was an extraordinary friend, a true Giant within the Housing Industry. He was a family man, with a story about his wife, Michael &/or Tommy always coming up somehow during our conversations. He was one of the most knowledgeable persons I have ever known. I respectfully referred to him within our circle of friends as "The Oracle of San Antonio". He was always there for us, always picking up the phone: weekends, holidays, day or night. We will forever remember you with gratitude and respect my friend. My condolences to the Flores family. I pray to God you find peace in your heart and knowing he now is our guardian angel. He was already our guardian angel on earth as he protected his employees and the residents that touched his heart like the elderlies. The 4yrs I got to work and know him was a pleasure, and loved that he would listen and cared for us. God bless you all and peace be with you. Our prayers are with the Flores family. May the Lord bring you comfort at this time...for he now resides in the Father's House. Nono will be missed by me and many others. Our deepest condolences to Flores family and friends! Que Dios te guarde y bendiciones ha tu familia. RIP AMIGO! My Deepest Sympathies to the Flores Family. Mr. Flores was a Leader among Leaders and a Giant within the Housing Industry. He was a tough but fair and compassionate and one who I've always held in very high esteem. He provided me an opportunity and ensured I had the tools to be successful. Mr. Flores undoubtedly had a very positive impact on the lives of countless individuals. I was honored to have served under his leadership. Deepest condolences to the Flores family. I am proud to have considered Mr. Flores a friend. May you rest in the light of our God, your new home is well deserved. Our hearts are saddened by your loss and our thoughts and prayers are with the Flores family. Our world will be a lesser place for his leaving it. His presence in a room always lit it up (or, now and then, set it afire. For 40 years, he was my friend, and I will miss his contributions to my life, especially those which came from his criticism and our disputes. Michael, Tommy...we have lost a good man who made our world a better place. My deepest condolences to the family. You will leave a void that can never be filled. I was one of the lucky ones who worked under your leadership at SAHA and will always remember your kindness and the respect you showed for everyone. Rest in Peace. My heart goes out to you, Mr. Flores' family. He ALWAYS was and showed kindness to me as a person and as an employee. God bless you all and grant you His Shalom Peace! A giant void is now present in the Flores family, the community and the Aggie Nation. I hold tremendous respect for this friend for his service to others, his dedication to his family and for his professional accomplishments. I have been proud to call him my friend for the past sixty years. My deepest sympathy to the Flores family. Nono, you will be sorely missed but timelessly remembered. Your light has always burned bright. And so it will still shine. May you Rest In Peace Nono. Our sincere sympathy to your family. Love and hugs to all of you for the loss of a man you love and who loved you dearly. He was a good and faithful servant in everything he did. Heaven is richer by this Aggie. My most sincere heartfelt condolences to all the Flores Families & Also the Henry Families. Prayers for strength & peace for all during this most difficult time. May he Rest In Peace. Nono was a true mentor to me, and a great leader at SAHA. He always set the bar high for all employees, and was respected enough that everyone tried their best to meet his challenges. I have a great respect for him and appreciate all he did to help me with my career at SAHA. God bless him.